Is a Good Domain Name Vital for Business Success? When registering a good domain name with a domain name registrar, it is always important to have the search term you want to be found for within the domain name itself. The person looking for your business will be typing in the nature of the business and the location, usually the town or city, or in the case of large cities, sometimes the district or area. For example, if you are an electrician in London, you will want a domain name which reflects this. I did a check just now to see if the domain name electricianlondon.co.uk is available, but it is not. Someone else has registered this name and may or may not have built a website from it, so it is time to search to see if different combinations of this search term are available. Domain names are not bought outright; they are registered for a fixed length of time for a fee. You can register a domain name for one year at a time, or you can register a domain for several years in one go, depending on the registrar you use. You can also get your registrar to automatically renew the domain at the end of the registration period so that it does not accidentally lapse. It should be noted that a .co.uk name is cheaper to register than a .com, a .net or an .org domain. You can use hyphens in a domain name, so I searched for electrician-london.co.uk, but this was also taken by somebody else. So I searched for electrician-london.com and found that this was available. It doesn’t really matter whether you get a .co.uk or a .com name from the point of view of getting a good listing in the search engines. I just think that for a UK based business it is better to have a .co.uk name. But a .com name is also fine. An .org or a .net domain name is acceptable as well, but do bear in mind that .net names are usually used for Internet-related businesses, and .org names are usually used for organizations such as public bodies and not-for-profits as well as commercial businesses. The .biz name is used for business although it is thought not to have the authority of the .com type of extension, but it is often used when the .com name is not available. Note that .edu domain names are reserved for educational establishments. So if you are a business in the UK, you should consider the .com or the .co.uk types. If you are in the US, you should consider the .us or the .com types. If you are located elsewhere, you should consider the .com type or the domain extension allocated to your country or more to the point, to the country where your market is. Always remember that the best format for a domain name is [occupation] + [location] which is what people will be searching for in the Internet. That is the format of the search query they will type into their search engine, and that is what you want your site to be found for, and the higher in the listings, the better. It may be that you already have a website and therefore that you already have your own domain name. In some cases these days when people buy an existing business, they will buy the website that comes with it. In each case, you will have a website with a domain name. So how does your existing domain name match up to the above requirements? In general, all should be well as long as your occupation, or the nature of the business is part of the URL of the domain name. For example, take the case of an existing business run by Raj Chadha who is an electrician in Harlington. If the existing domain name consists of [name] + [occupation] (e.g. rcelectricalcontractors.co.uk) this will usually be fine. Keyword competition research will need to be done on this, though. Because remember that we need to be found for the occupation and the place name. Hopefully, in such cases, there will be no need to register a new domain name if the competition for the place name is low. In cases where the existing domain name consists of [name] + [location] (e.g., raj-chadha-harlington.co.uk ) then we may have a problem. In this case, the occupation is missing. And, after all, it’s the occupation that the searcher is looking for! Nevertheless, keyword research may show that competition for that occupation within the location is low, so we can make do with the existing domain name. Does Domain Name Affects Local SEO? However, in cases where the existing domain takes the form [name] only e.g., rajchadha.co.uk then clearly we have a problem. Neither the occupation nor the location is stated in the URL of the domain name. Keyword research will need to be done as before, just to make sure. But experience shows that a new domain name needs to be registered because the existing one is inadequate for the job. In such cases, there may be no need to build a completely different website from the ground up – just to transfer it to the new domain. 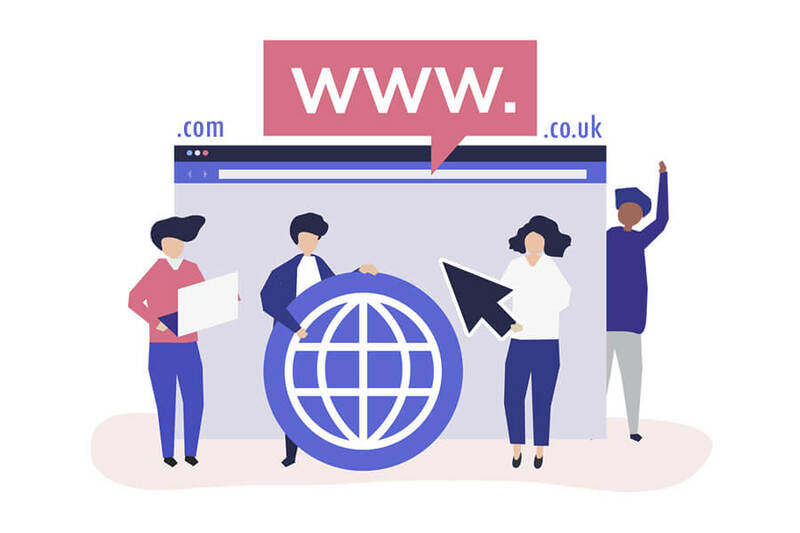 In some cases, where a business has been bought as a going concern, and the name of the website consists only of the previous owner’s name, then the present owner will probably want to get a new name for altogether more obvious reasons! Of course, if you have no website to start with, then the problem does not arise. You can search for the perfect domain name based on the [occupation] + [location] criteria as described above without having to decide whether or not the existing name is suitable. Equally suitable would be an existing domain name which consisted of [occupation] + [location], of course (e.g., electrician-london.co.uk or londonelectrician.co.uk, which would be ideal. If you have any problems with what would be the best domain name for your business, or if you have an existing domain name but are not sure if it is suitable, then contact me in the first instance by email: support [at] localseohero.co.uk.